Definition at line 402 of file Metadata.h. Definition at line 421 of file Metadata.h. Definition at line 409 of file Metadata.h. Referenced by llvm::Module::addModuleFlag(), llvm::GlobalObject::addTypeMetadata(), llvm::GlobalObject::copyMetadata(), createAccessTag(), llvm::DIBuilder::createBitFieldMemberType(), llvm::MDBuilder::createConstant(), llvm::DIBuilder::createInheritance(), createStringMetadata(), DisableAllLoopOptsOnLoop(), foldCtpop(), foldCttzCtlz(), getConstantOrNull(), getKeyValMD(), llvm::MDNode::getMostGenericRange(), getMulHu(), llvm::ValueAsMetadata::handleRAUW(), isKnownTypeIdMember(), LLVMMDNodeInContext(), LLVMValueAsMetadata(), PushArgMD(), llvm::WholeProgramDevirtPass::run(), selectJumpTableArmEncoding(), llvm::LoopVectorizeHints::setAlreadyVectorized(), splitGlobal(), llvm::UpgradeIntrinsicCall(), llvm::UpgradeModuleFlags(), and llvm::UpgradeTBAANode(). Definition at line 413 of file Metadata.h. Definition at line 417 of file Metadata.h. 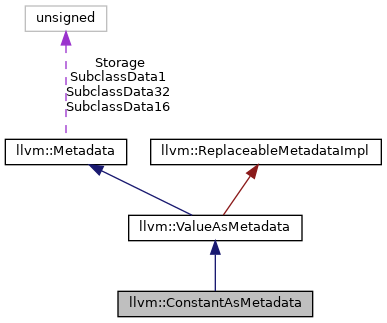 Referenced by getSummaryFromMD(), and wrapConstantAsMetadata(). Definition at line 403 of file Metadata.h.